In October of 2015 Microsoft announced the release of Skype Translator, and now Mercuri Conferencing is pleased to announce Skype Translator for your conference calls as part of Mercuri’s Skype Direct service. 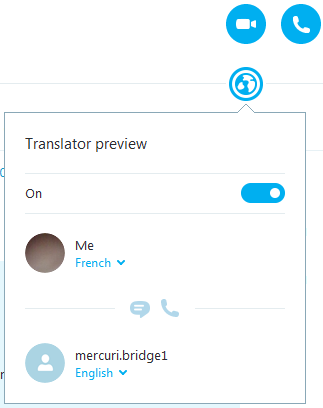 Now when you dial into your conference call using Mercuri’s Skype Direct with Skype Translator enabled your speech will be translated to the language you have chosen while you listen to the foreign language translation as well as read the translation in the chat window. It has never been easier to communicate with people in 8 available languages! In Skype select the Mercuri contact, then click the globe icon and set your language and the language of the conference, then click the phone icon in the top right corner. Take it to up a notch with UN style multi language conferences when more than 2 languages are used in a conference. Each participant sets the conference language and their own language in the Skype Translator settings and then dials in via Mercuri Skype Direct using the Audio Call button in the top right corner. After entering the passcode they will join the conference and be able to listen to the conference call translated into their own chosen language in both audio and text, and anything they speak in their own language will be translated in audio into the conference call, all while being able to hear the original speakers as well. Of course you can still use Mercuri Skype Direct to just connect to your conference call without the translator, and as always Mercuri recommends a USB headset for the best possible audio experience. Another innovative application of Mercuri’s Skype Translator service is for use with the hearing impaired. By simply setting the language of the conference call for both the Skype caller and for the Mercuri Contact to the same language the caller will be able to read a real time transcript of the conference call in progress and still participate in audio. Watch the 2 minute demo Youtube videos below or just upgrade to the latest version of Skype and add the Mercuri Contact if you don’t already have it. There is no extra cost to use this innovative new service so give it a try!